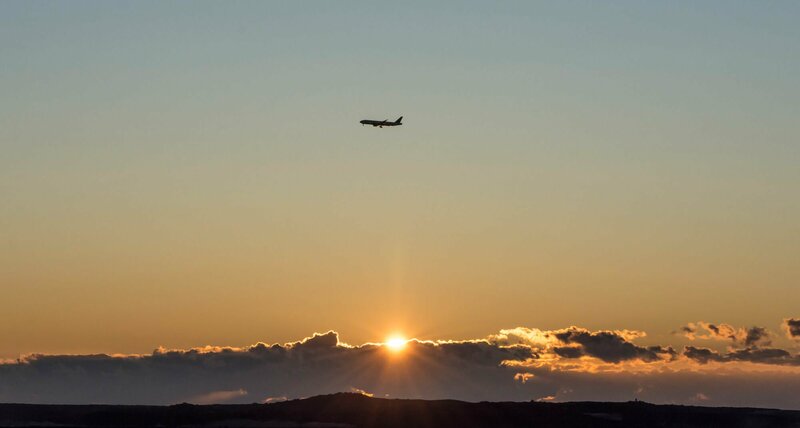 All of you travelers out there will agree with me that not everything in a trip can be forecasted and planned for, especially when it comes to our health. Little annoyances or even accidents may happen and we or any of our travel companions can get sick away from the nearest medical attention point. And that applies to either family members, friends or complete strangers in need. And we don’t want that to stop us from traveling, right?! 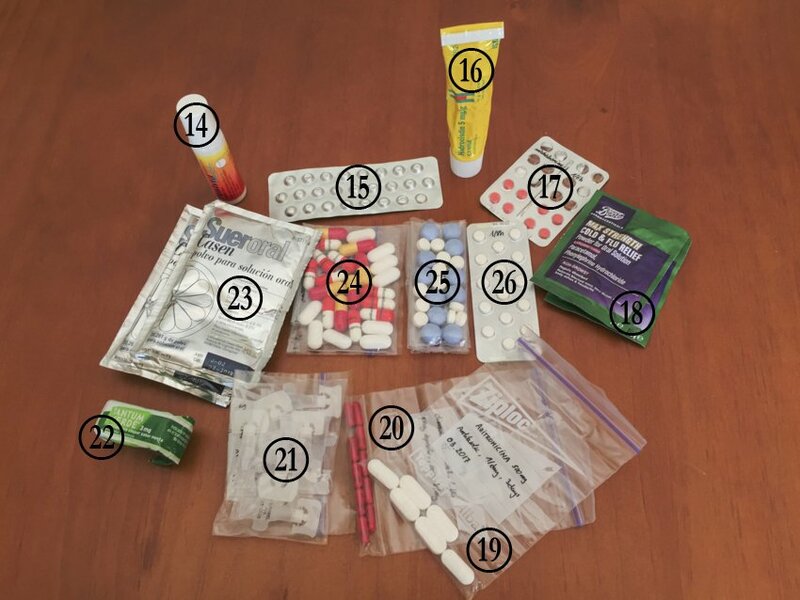 That’s why some time ago I tried to put together a small and lightweight first aid kit based on my experience as a seasoned traveler and as a Red Cross volunteer, which I’m continuously trying to improve. Bites, scratches, rashes, blisters, splinters and small first-degree burns can all be easily resolved while on the move with just a few items in this first aid kit and some hygienic precautions and do not require monitoring unless infected. Other symptoms like a headache, a sore throat, runny nose and eyes, stomach pain, diarrhoea, nausea and vomits can also be initially treated with over-the-counter using this first aid kit and will buy us some time to find a doctor around. What’s wrong with commercial first aid kits, you may ask?. In fact there is nothing wrong with them, actually I used a commercial one for a some time. But after a while I realized that I wasn’t familiar enough with half of its content or at least not enough to use it with confidence. And if anything, you always want to trust your first aid kit. This means you need to know when your kit will come in handy and how to use every single item it includes. RULE #1: Know your kit and its limitations. Another reason why I’m not a fan of commercial kits is that they are too generic as they try to cover the most common standard situations. In other words, they are never fully tailored to your needs, the activities you plan to do, the duration of your trip and your personal medical conditions or of your travel buddies. RULE #2: Taylor the kit to you needs, destination and travel duration. You would never pack malaria tablets when traveling to the arctic region, would you? And if traveling with kids, you would never forget to note the paediatric dosages of everything you’re carrying, would you? And you should always take into account your allergies and pre-existing medical conditions when planning the kit. For example, if you are prompt to severe allergic reactions, consider adding an Epipen or similar as per you GP advice. Don’t get me wrong. I don’t mean you should avoid commercial kits at all. You may be lucky enough and find the perfect first aid kit off-the-shelf at your local pharmacy that works for you and your family most of the times. It just takes a bit of searching and trying. And if you’re not happy with the one you’re currently using, you can always use it as a starting point and follow this or any other guide out there to convert it to your best travel companion. As it’s health what we are talking about here, caution is always important. If at some point you’re in doubt or do not know how to react at all with you kit, do not be a know-it-all and seek for help immediately. You would be unknowingly worsening the situation. This point is strongly connected to Rule 1 (I hope I’m not getting too boring here 🙂 ). RULE #3: When in doubt, do nothing and immediately seek help. Chances are you already include at least one type of antibiotic in your current first aid kit. Antibiotics must be used with care and prescribed by your GP. You may revert to them as a last resort only, and never to treat a simple cold. Remember: different antibiotics target different bad bacteria types, and the more antibiotics you take, the more resistant those bad bacteria in your body become and the less good bacteria remain, which might cause other problems in the future. RULE #4: Go easy on antibiotics. Ask your GP before packing them. 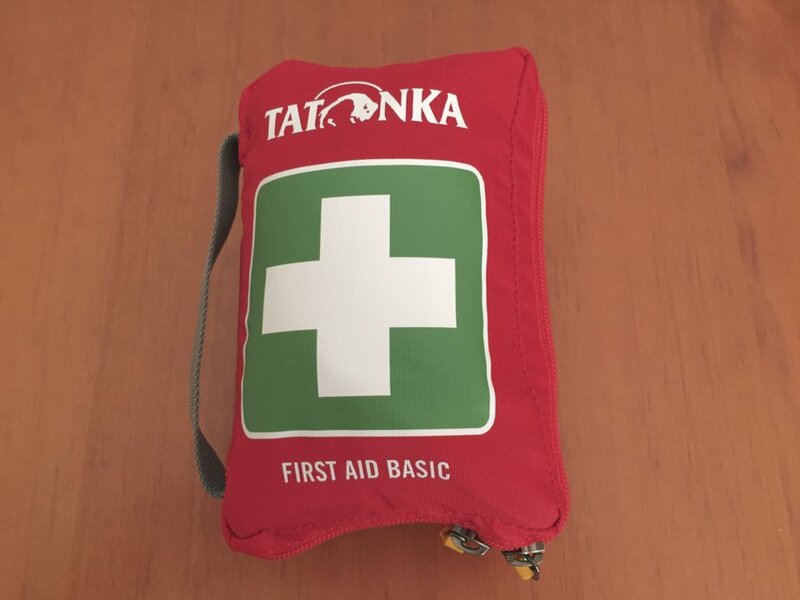 A first aid kit is meant to be used to provide just that, first aid. And to buy us some time until qualified help is available unless things are not getting any better. That’s why it never hurts to keep at least one emergency phone number in the kit, relevant to the area we plan to visit in our trip. RULE #5: In all cases, if symptoms persist seek for medical help as soon as possible. Finally, medication is useless if we don’t use it in the right way. Therefore, you should always keep track of administration instructions and dosages. If you use zip-lock bags for your pills/tablets, write this. information on them with a water-resistant pen. And the same applies to best-before dates and special precautions. Of course, you have to regularly check your first aid kit and replace any missing or outdated item. RULE #6: Always keep track of instructions, dosages and best-before dates. When preparing a first aid kit, the fist step is to decide on a proper container that should be relatively small, lightweight, durable and ideally waterproof or at least showerproof. There are many options out there and it’s more of a personal choice. I picked a nylon bag (15x10x10 cm) with a waterproof zipper and several internal pouches for proper organization. There are a number of general items that must always be present in a first aid kit, such as antiseptics and wound cleaning and dressing material. You don’t want to end up with an infected open wound out there, do you?! Besides the cleaning and dressing material, I like to throw in some travel sickness and water purification tables as a prevention, and something against the symptoms of the common cold and flu. But that’s not all. 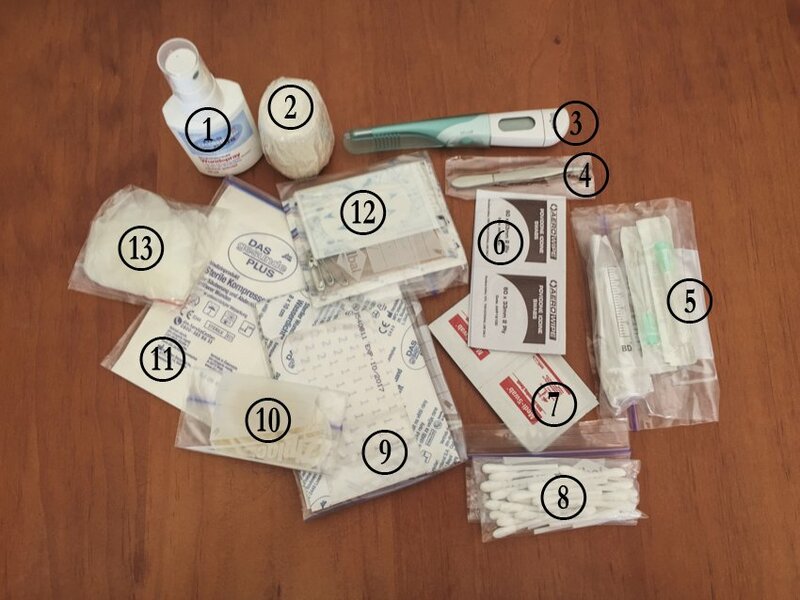 I thought I would put a first aid kit checklist together with pictures for you guys, for when you’re packing for the next adventure (you can also download this checklist in pdf format if you scroll to the bottom of this post). 15 – Water purification tablets. Micropur Forte or similar, 1 tablet yields 1 liter of disinfected water. 24 – Painkillers. 6 capsules of Paracetamol 1000mg. 24 – Antinflammatory. 6 tablets of Ibuprofen 600mg. 17 – Antihistaminic. 8 tablets of Polaramine 2mg. 18 – Cold/flu symptom relief. 3 sachet of Lemsip. 22 – Sore throat treatment. Tantum Verde sweets. 20 – Diarrhea treatment. 10 tablets of Loperamide 2mg. 26 – Nausea treatment. 10 tablets of Primperan 10mg. 23 – Rehydrating salts. 3 sachets. 14 – Insect bite relief. 1 roll-on of Fenistil. 16 – Skin rash relief. 1 30g-tube of Hydrocortisone 5mg. 3 – Electronic thermometer. Less fragile than classic mercury models. 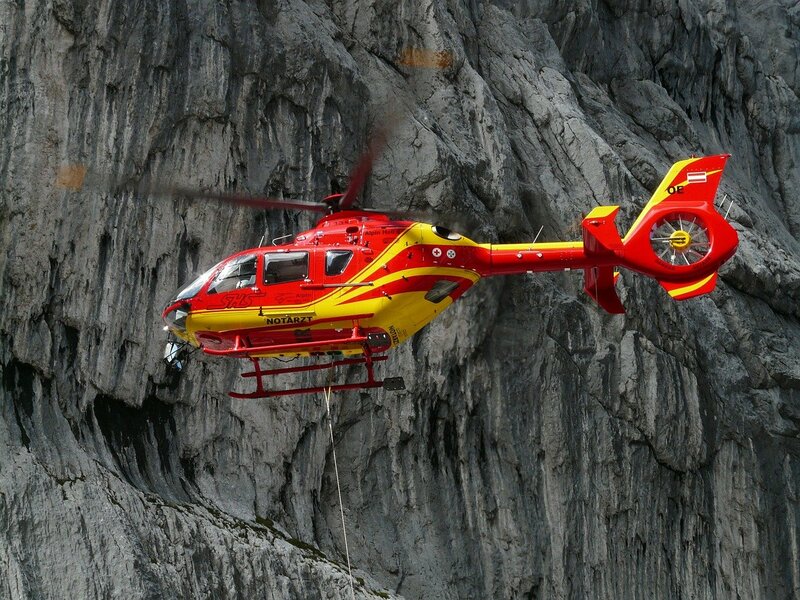 Emergency phone number and address of the nearest hospital or emergency service, or you travel insurance hot line. A thermal blanket (aka space blanket). Always know your kit and its limitations. And NEVER include anything you don’t know how to use or operate. Always tailor the content of your kit to the region you travel to, the activities you plan to do and the duration of your trip. If you doubt how to proceed when in an emergency, the wisest thing to do is to separate the victim from the source of danger and seek help immediately. Antibiotics must be used with care and prescribed by your GP. You may revert to them as a last resort only, and never to treat a simple cold. Remember: the more antibiotics you take, the more resistant the bad bacteria in your body become and the less good bacteria remain, which might cause other problems in the future. In all cases, if symptoms persist seek for medical help as soon as possible. Always keep track of instructions, dosages and best-before dates. If you use zip lock bags for your pills/tablets, write this information on them with a water-resistant pen. You can also download this checklist in pdf format here, far more convenient when packing!!! Do you have any question or comment? We would love to hear from you! Just drop us a line in the comments sections a let’s talk! 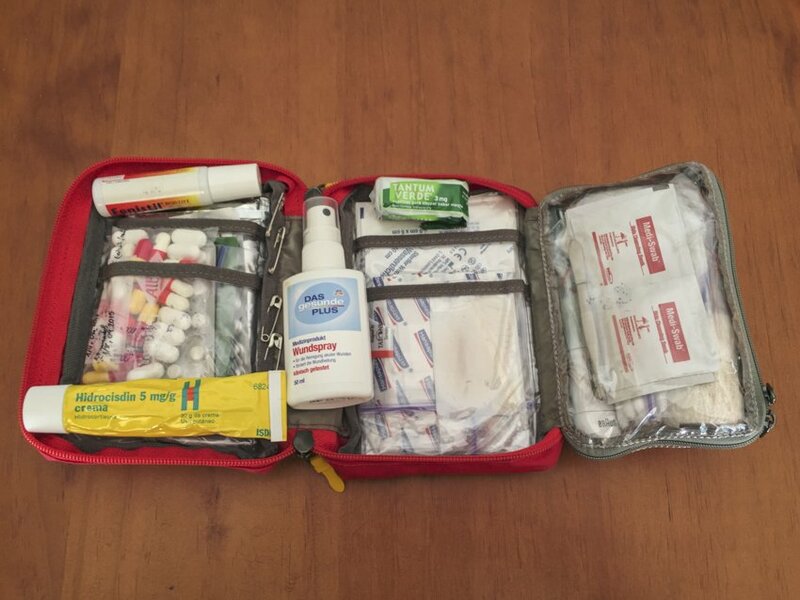 2 Comments on “The ultimate traveler’s first aid kit you don’t want to leave behind”. Join the Conversation Here! Great information! I totally agree with not buying a generic first aid kit. I’ve seen them that don’t have a whole lot more than bandaids. How is that going to help me when I have a stuffy nose or sore throat in the middle of the night in the middle of no where? LOL! And that seems to be the only time we ever need a first aid kit. Hi Natalie, so true! You would be surprised at the amount of people that buy one off-the counter and go on a trip without even checking what’s in it. And then of course, oh surprise, they never come with what one needs the most. Thanks for your 2cents!